Sourced from the finest sustainable tree plantations in Indonesia, our Modular 40 Bottle Wine Rack is now more durable, more beautiful and more eco-friendly than ever before. New and Improved--Stronger in Mahogany! Sourced from the finest sustainable tree plantations in Indonesia, our Modular 40 Bottle Wine Rack is now more durable, more beautiful and more eco-friendly than ever before. Hand-cut and hand-sanded allowing for even coloring and grain, and less dark markings. A strong, quality wine rack that is expandable on all four sides and extremely versatile. Complete with wood dowels and pegs for fast assembly vertically, horizontally or on an angle...the choice is yours. Complete kit holds 40 bottles and can fit champagne bottles. What are the dimensions of the modular wine rack 2 bottles wide by 12 high? I would say about 9 3/8" W X 49 3/8" H.
How configurable is the system? For example, can i create a rack 10 bottles wide and 13 bottles high? BEST ANSWER: Thank you for your inquiry. Yes, this system can be configured in any way up to 40 bottles. If you have any further questions, please feel free to contact us directly at 800 356 8466. Thank you again. can you get several sets, put them together, and have the unit hold say 120 bottles? Can this wine rack be mounted on a wall? BEST ANSWER: Thank you for your inquiry. I suppose you could anchor to the wall but one would need to be very careful as each bottle weighs 3 lbs. if you have any further questions, feel free to reach out to us at 800 356 8466. Thank you again. Will this rack accommodate champagne bottles that are slightly larger than still wine bottles? BEST ANSWER: Thank you for your inquiry. 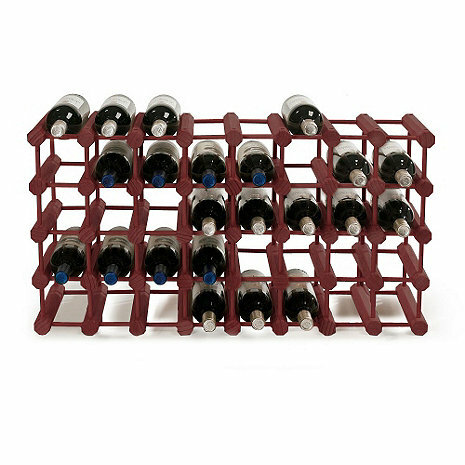 Yes, the Modular 40 Bottle Wine Rack will accomodate up to a Champagne-sized bottle. If you have any further questions, feel free to reach out to us at 800 377 3330. Thank you again. Can a 40 bottle unit and part of a 12 bottle unit be combined to make a unit 7 rows of 7 (49 bottles)? Conversely, can you purchase 9 extra modules to add to a 40 bottle unit? BEST ANSWER: You can combine a 40 bottle and 12 bottle modular unit. These are sold in sets of 40 modules and 12 modules. I'd like to use the module to have 5 bottles wide by 10 bottles high. Are there any additional supports I will need to maintain the integrity of the rack over time? Would this require any clip-ins to the wall? BEST ANSWER: Yes they would require that you anchor them to the wall for support. Can this rack fit Magnum size wine bottles? What is the dimensions of the individual openings? BEST ANSWER: This will not hold magnum bottles at the opening is only 4 inches by 4 inches. Can I use this rack to stack 8 high and 5 wide? Will that hold? BEST ANSWER: Yes you can. Please evaluate the height chosen and location to determine if you need to secure to the wall for stabiliy. what are the dimensions of this rack -- the description only says 11"
BEST ANSWER: The rack is 11"D and each square when building this takes up 4" height and width and then you need to add 1 3/8" to the final width and height. So for example if you want 8 bottles wide and 4 bottles high you will measure 8 x 4"=32"+1 3/8"=33 3/8"W and 4 x 4'=16+1 3/8"=17 3/8"H.
What is the overall dimensions of this rack? Can this unit be stacked with a second 40 Bottle Rack and remain secure? BEST ANSWER: Yes, the rack can be stacked and remain secure. Poor materials - do not buy. I have purchased a similar product previously, so maybe it is that this mahogany style (color anyway) is really just very flimsy, cheap wood that has been stained to hide the poor wood quality. The pegs break off very easily and even crumble. Other products I have purchased from this source have been very reliable in the past. Looks great - What a challenge!! Very time consuming to put together and the pegs will break off. Luckily they do send extra pegs, but the trick is to drill out the broken ones!! Wish I had read some of these other reviews prior to ordering, but too late now. Not easy at all to assemble. Over half of the pegs were too large to fit into the holes in the blocks. Ended up taking a razor blade and shaving the ends off of all the pegs so I could get them in, then hammered in from there. Ended up with a few blisters by the end of the project. Expected much more out of this, and I'll be hard pressed to purchase another product from this site. Nice once you get it together. A rubber mallet is essential to assembly. Some of the pegs & holes are not uniform making it a little challenging. This product is clunky and impractical. It is extremely difficult to assemble and even if you do, the joints that connect the pieces of wood forming the frame hardly ever line up and the end product is flimsy, angular and not at all what I was expecting. I was so excited when I received this product in the mail and then I couldn't even bring myself to finish putting it together because it was so time consuming, challenging and worthless. This product left me deeply disappointed and deterred to ever purchase anything from wine enthusiast again. I used a large portion of my American Express rewards points for this product and I feel they were totally 100% wasted. It's really crushing and upetting. This rack was so difficult to assemble that we gave up after it was 25% complete. The holes are not uniformly milled, so lining up the connecting rods is virtually impossible. In some sections, there are no holes. The 25% which we did complete is unstable and uneven and really useless. DO NOT BUY THIS PRODUCT !! You will be wasting your money and will be sorely disappointed. I don't know why Wine Enthusiast carries it, as I now see other negative comments similar to mine. [...] putting it togetehr went very smoothly. The wine rack arrived on time as promissed. The absolute disappointment came during assemebley that was I was never able to complete. If one cube doesn't assemble 100% square it throws the rest of them all off. So do the math... 160 wood pins hold this system together. Was never able to get further than 12 cubes. I even had a carpenter handman friend come help and after two hours of frustration the [$] purchase ended up in the recycle bin. Partial assembly makes it impossible to disassemble and return for a refund. So the minute you begin assemble you have no chance of returning. Don't fall victim to this cruel wine system. I re-oerdered 6402404 compact cellar cubes. Put four of them together as one storage unit! Worked perfectly and was very easy to assemble and it looks amazing. Excellent service! Besides the bad experience with the actual product, WE has my business. Could not put the product together straight looked so crooked. Pegs kept breaking. Then couldn't get the pegs apart. Painted finish looked real cheap.